can you believe that this is the last week of summerfest? over in the blink of an eye? football has started, children are back in school, daylight is ending earlier and earlier...fall, here we come. when i first saw the summerfest schedule, i was a bit surprised to see that we were ending this year's lineup with broccoli. i never think of it as summer produce. it is one of the vegetables i seem to eat during fall and winter. 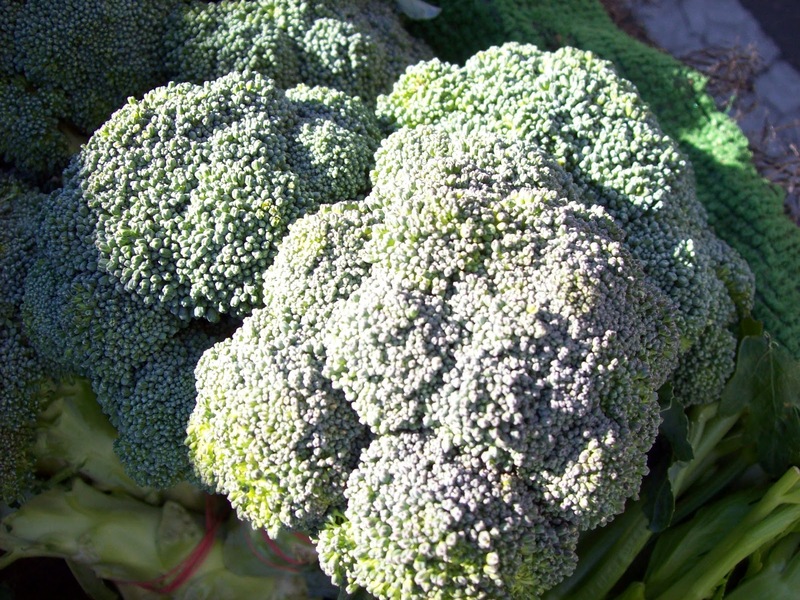 but in california's cooler regions...like the coast...broccoli is grown year round. and in late september/early october you will find it is extremely tender, fresh and a perfect bridge to fall foods. preheat oven to 425 degrees. prepare broccoli by first washing and removing leaves. (save for a stir fry, soup or stock). 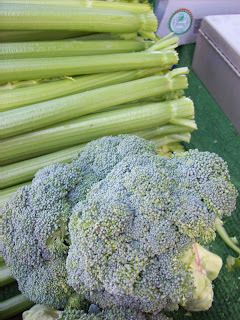 cut off stem and then cut broccoli in half lengthwise and then again into quarters. place one of the cut sides down on cutting board and...with the knife at an angle...cut off stem. repeat with remaining three pieces. 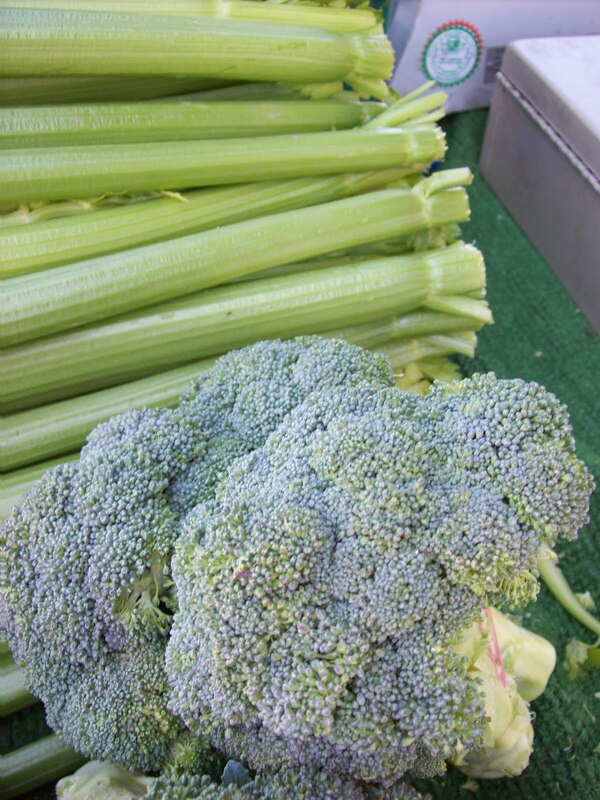 break broccoli into bite sized florets. place prepared broccoli on a rimmed baking sheet. run 4 passes of e.v.o.o. bottle over pan and, using your hands, roll in oil ensuring evenly covered. place in preheated oven for 30 minutes. remove from oven and add garlic and onion and another 2 passes of e.v.o.o. stir and sprinkle red pepper flakes, salt and pepper over vegetables. return to pan and roast for another 30 minutes, stirring every 10 minutes or so, adding additional oil only if necessary. keep roasting until the broccoli is deep brown and caramelized on all sides being careful not to let burn. remove from oven, taste and adjust salt if needed. place on a serving platter and pour all e.v.o.o from pan over vegetables. serve immediately. tedx napa valley is this weekend...are you going? i am thrilled to be an in-kind sponsor for this weekend's first TEDx Napa Valley event. are you familiar with TED? In the spirit of ideas worth spreading, TED has created a program called TEDx. TEDx is a program of local, self-organized events that bring people together to share a TED-like experience. Our event is called TEDx Napa Valley, where x = independently organized TED event. At our TEDx Napa Valley event, TEDTalks video and live speakers will combine to spark deep discussion and connection in a small group. The TED Conference provides general guidance for the TEDx program, but individual TEDx events, including ours, are self-organized. An enjoyable fall afternoon filled with live performances and TED speaker videos at the Napa Valley Opera House. Mingle with other guests during intermission with snacks then have the opportunity to meet the speakers during the after program wine & beer tasting and food sampling. This TED-like experience will be the catalyst to inspire the achievement of common goals. They will ignite excitement which will go on to live locally in the conversations that ensue, and worldwide as part of the TED community. **The live talks will be taped in real time and the best of the presentations will be submitted to TED in New York for consideration as TEDTalks and potential posting to TED.com, translation into multiple languages for the fast-expanding and global TED.com community. Attendance at TEDx Napa Valley is for: dynamic thinkers, positive reinforcers, determined citizens, those searching for answers to questions never asked, and those willing to question the answers already given. We’re seeking to bring together: inspiring teachers, engaging locals, community leaders, innovative individuals, and those with a sense of humor. the speakers conclude their presentations at 5:00 pm and there is a reception from 5:00 pm-6:00 pm featuring food, wine and beer from local producers. napa farmhouse 1885(tm) is proud to be an in-kind sponsor for this amazing event. 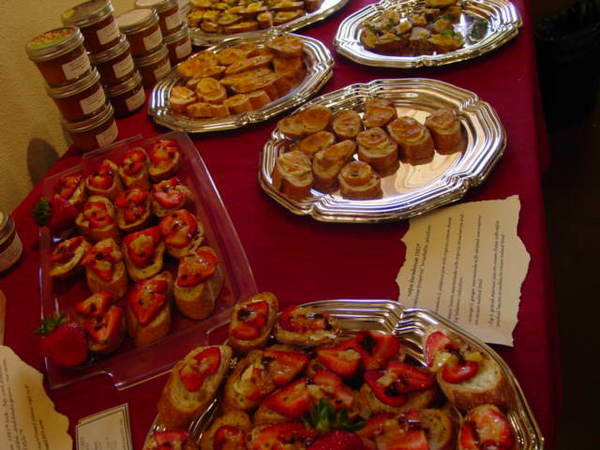 we will be preparing appetizer "bites" featuring our farmhouse food. click here for a list of participating sponsors. i hope bay area locals will be able to attend this event....for everyone else, have you been to a TED, or TEDx experience? have you seen the summer issue of everyday food magazine? i am writing this post on the day before labor day and am in a bit of a shock. labor day? already?? really? summer in napa has been cooler than usual with many, many morning skies covered with a thick layer of fog. cold & gloomy...similar to my 15 years living in san francisco...not my fantasy of sun filled skies while breakfasting by the pool. i want and need sun...and heat...during summer. it keeps me going during our long and rainy winter and spring season. happily, it has been warming up mid-day lately, and september and october often can be our warmest months. i am going to grab every bit of sun i can for as long as i can. 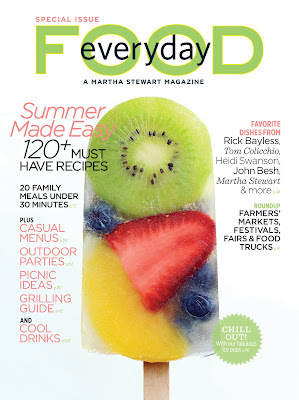 earlier this summer, i received an email from the folks at martha stewart living's magazine everyday food letting me know they were about to launch a special summer edition. they told me it was gorgeous and asked it i would like a copy. can you say...yes?! the magazine arrived and...oh my...they were not exaggerating...not a bit. everyday food is normally a "pocket size" magazine...perfect for tucking in your handbag...handy for use at the market. this edition is full sized, full of terrific sounding recipes and absolutely beautiful photos. “Photos by Con Poulos. Copyright © 2011, Martha Stewart Living Omnimedia, Inc. Originally published in the Special Summer Issue of Everyday Food magazine." i think i have made every dish from this special issue. 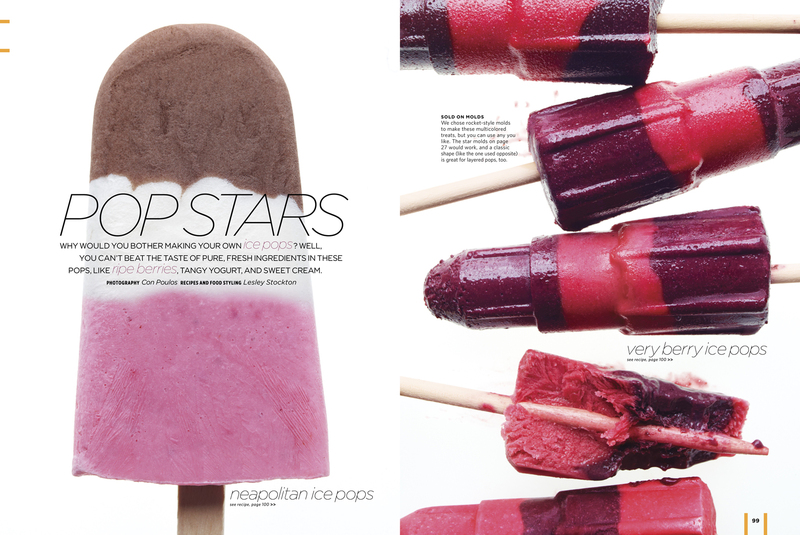 there is an article on ice pops featuring fresh fruit pops, neapolitan pops, fruit juice pops, mojito pops, peaches and cream pops...and on and on. i have been making and eating them all summer. you can't go wrong with any of the recipes...try the grilled salmon with sweet corn relish...the relish is made with fresh corn, tomatoes, avocados and red onion, or maybe you are in the mood for just the corn...grilled and coated in a spicy cheese coating (yum) mexican-style grilled corn. perhaps you need a last minute appetizer for a labor day celebration tomorrow...the tomato tartlets would be a perfect choice. but, before i link you to every page of the magazine, i am going to stop and urge you to go buy it. this is one edition you will want to own...and keep. buy it now, so that you can make everything before the season is over...i plan to continue through the end of october while many of the ingredients are still in season....and then use again as soon as possible late spring, 2012.
i will share one more recipe...one that i have made many times this summer...ice cream sandwiches with frozen yogurt. imagine yummy (and gluten-free) almond-meal flour cookies filled with frozen yogurt. how perfect is that? i first made the cookies for a pot-luck party earlier this summer. i had a 14 yr old "helper", whose job it was to taste and give me feedback. as you can see, she loved them...as did everyone else... thanks allie! in a medium bowl, whisk together flours, starches, and salt. in a large bowl, using an electric mixer, beat butter and granulated sugar on high until pale and fluffy, about 3 minutes. add vanilla and egg yolk and beat until combined, scraping down bowl as needed, 1 minute. with mixer on low, gradually add flour mixture and beat until dough comes together (dough will be sticky). form dough into a disk, wrap tightly in plastic, and refrigerate 2 hours. preheat oven to 350 degrees. on a lightly floured work surface, roll out dough to a 1/4-inch-thick round. with a 2 1/2 inch fluted cookie cutter (or any shape you like) cut dough into 24 rounds and place on two parchment-lined rimmed baking sheets (reroll scrapes if necessary). freeze 15 minutes, then bake until cookies are lightly golden, 10 to 12 minutes. let cool completely on sheets on wire racks, 20 minutes. (to store, transfer to an airtight container at room temperature, up to 3 days) to serve, transfer frozen yogurt to refrigerator to soften, 20 minutes. scoop 1/4 cup frozen yogurt onto flat sides of 12 cookies and sandwich with remaining cookies.